Children learn more when their parents and whanau are interested and involved. There are many things we can do to support our children’s learning in mathematics by using the everyday experiences and resources that we find around the home. One way to support maths learning is to notice the maths all around us. Raising our children’s, and our own, awareness of maths helps them understand that it’s part of how the world is put together and how we can understand it. This can be as easy as noticing the odd and even numbers on letterboxes or looking for different shapes when we’re shopping like cubes, cylinders or spheres. We all use numbers and measurement in our everyday lives, and it’s important to share this with our children. When we share the maths that we use, it helps our children to understand that maths learning is an important part of living and working and that it has value. You can ask your children to read the time, or measure ingredients when you’re cooking, or talk about how much petrol costs and how many litres it takes to fill up the car when you’re at the petrol station. Or ask for their help when you’re looking through the weekly grocery fliers – get them to tell you what the best deals are. Having a strong partnership between home and school helps children’s achievement. It’s important to talk to your children’s teachers and support their school work by practice and homework. Another way we can support our children’s learning in mathematics is by building their confidence through giving them honest praise and encouragement. A simple high five or a smile when they have figured something out or when they just keep on trying - it tells them that we think they are clever. And most importantly it tells them that we think they are doing is worthwhile. 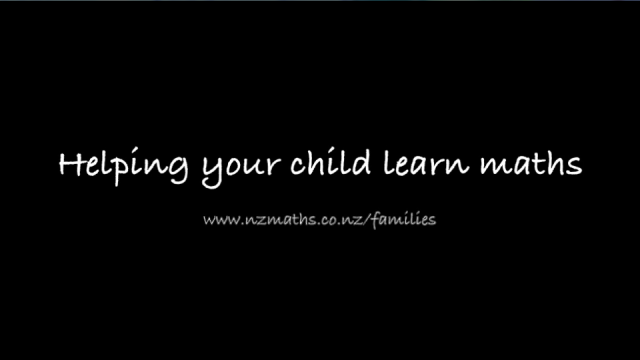 In the nzmaths Families section there are lots of resources for helping your child learn about numbers – this will help them with the maths they do at school. The Maths at Our House section includes ideas for how you can share mathematics using everyday experiences and things you’ve found around the home. It also gives you ideas for supporting your children’s learning in all areas of maths – geometry, measurement, statistics, algebra, and number. Finally, a maths kete is a handy resource to have in the home when your child wants to have some fun with maths or they need a little help with their homework. With your help your children WILL succeed in maths. Right click and choose 'Save As' to save a copy of this video to your computer (mp4, 29.3MB). Click to view a version of this video in Māori.